Do you want to be Young? 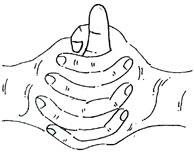 Interlock the fingers of both the hands and keep the thumb of the left hand vertically straight and encircle it with the thumb and the index finger of the right hand.. Practice it any time you want. But don't practice it a lot as it produces heat in the body.. It can cause sweating even in winter if you practice it longer. I tried just five minutes ago. Fell the heat all over my palm. Is it OK ? Can this help with cold hands and cold feet? Is there a mudra to cool down the body?